How pretty are those trees? I stamped my trees from Stampin’ Up!s Peaceful Pines and the sentiment is from a retired Stampin’ Up! set called Many Merry Messages. The colours I’ve used are Coastal Cabana, Whisper White and Silver. Whenever I’m in doubt for a design for a card – I layer. 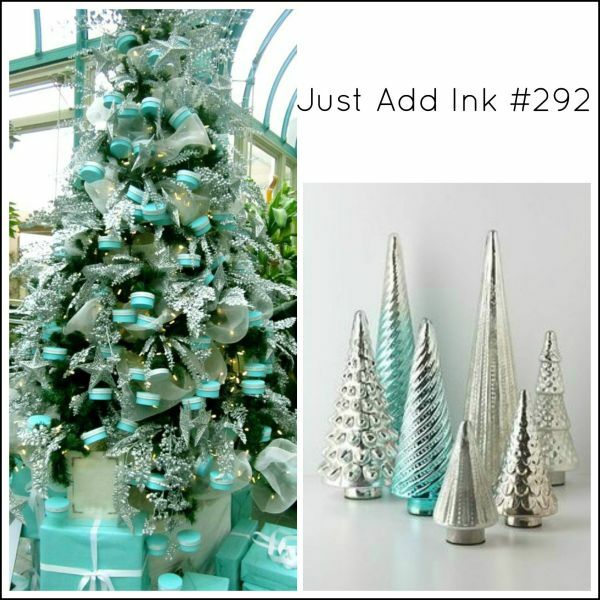 The girls at Just Add Ink have created wonderful projects for you. Head over to Just Add Ink and take a look. So pretty Narelle,love the soft and delicate colours!!! Beautiful card, Narelle! The soft colours and the touches of silver work work so well together. I loved this inspiration pic and couldn’t wait to make a card using it! I’m on track for everything except my Christmas cards. How’s that for irony! I love your take on these colors. The brick wall behind the trees is fabulous and the trees themselves are so beautiful! Totally classic Narelle card – Lovely layers, great texture, pattern & detail with a little bling to finish off. You’re amazing girl!